We created this handy 15 wines 90 points or more and under $15 chart out of my love for affordable wine! During the week, I rarely open a bottle of wine that’s over $15 since it’s just my weekday glass. We save the pricey bottles for special occasions! It can be frustrating trying to find a cheaper wine that has a high score and tastes great. Most of the time I take a chance with the best packaging or design (haha), but that method doesn’t always work! This list features the best low-priced red and white wines rated by wine guru Robert Parker Jr. of The Wine Advocate, Wine Spectator and Wilfred Wong (yeah he’s BevMo’s guy, but there are some really good wines within his picks). You really can’t go wrong with any of these wines! 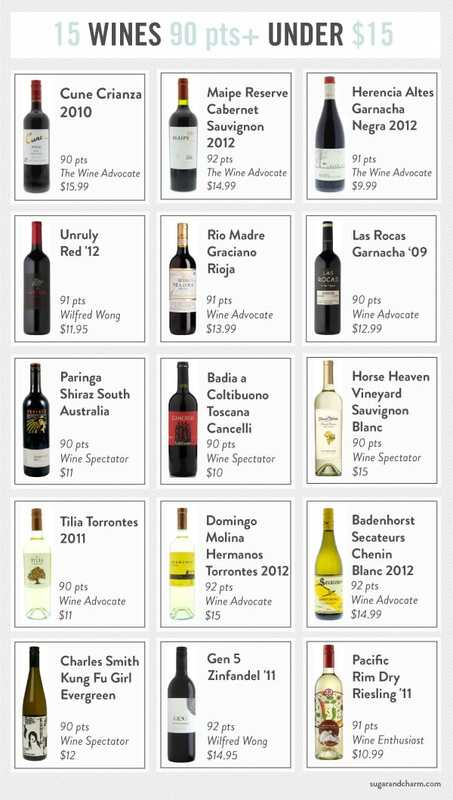 Jot a few down or study the names and next time you’re wine shopping you’ll remember a few of these to grab and enjoy! And one of my favorites is Apothic Red. It’s very good and only $12! Great list! I wanted to add that malbecs are wonderful and I’ve found quite a few good ones in that price range too. Thanks Gretchen!! Let us know some of your faves, we’re always into growing the list! Thanks again!